If you have a small garden we have some handy tips to help you make the most of your outdoor space. Being a garden its important to incorporate as much plants in your garden as possible. If you have high fences or walls, they would be perfect for using wall mounted planters or trellis for climbing plants. This will enable you to enjoy the green scenery without minimising the square footage of your garden. If you have large trees or bushes it is worth keeping them maintained so that so they don’t block too much sunlight into garden. Just like having a small house, you can use outdoor mirrors to create the illusion of space. Large outdoor mirrors will also help lift your garden by reflecting more natural light. You can also improve your garden by simply painting the fence. A lighter or more natural colour can help lift your garden into feeling more natural and airy. In a small garden, try to find clever storage solutions such as benches that have storage under the seating area. This can provide additional seating as well as storage. Avoid large storage units such as sheds which can take a lot of room. Garden furniture should be kept simple such as benches or furniture that is not too bulky. Look for furniture sets that can also be easily stored in the corner. 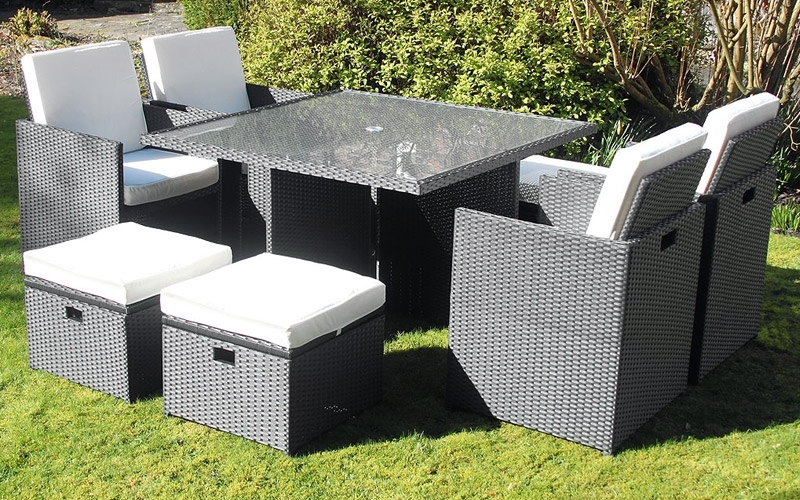 Some furniture sets such as our rattan cube sets are designed to save space when not in use. All the chairs and stools cleverly fit under the table and this can be tucked away in a corner.